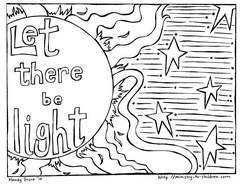 Creation Coloring Pages "God Made the Sun, Moon, and Stars"
Here is the latest in our series of coloring pages about the days of creation. This one is from the 4th day and features the objects described in Genesis 1:14-19. This line art illustration is from Mandy Groce. Be sure to check out all our Sunday School coloring pages. We would love to hear how you are using these resources in your ministry. Just leave a comment below to let us know. You can also express your appreciation for Mandy’s work. The coloring sheet shows four panels, each with a different configuration of the Sun, Moon, and stars. 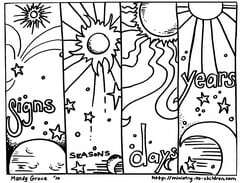 The captions say, “Signs, Seasons, Days, Years.” This is a quote from God in the Bible verse below. It reminds us that God made the objects in space. This passage also symbolically points to God’s creation and ownership of time itself. The eternal God marks the passing of time with an awesome display of his power. Directions: Click on the image above to download this resource as a printer friendly PDF file. Alternately, you can download the image as a jpeg image file (884K) if you want to resize or paste it into a Word Document. 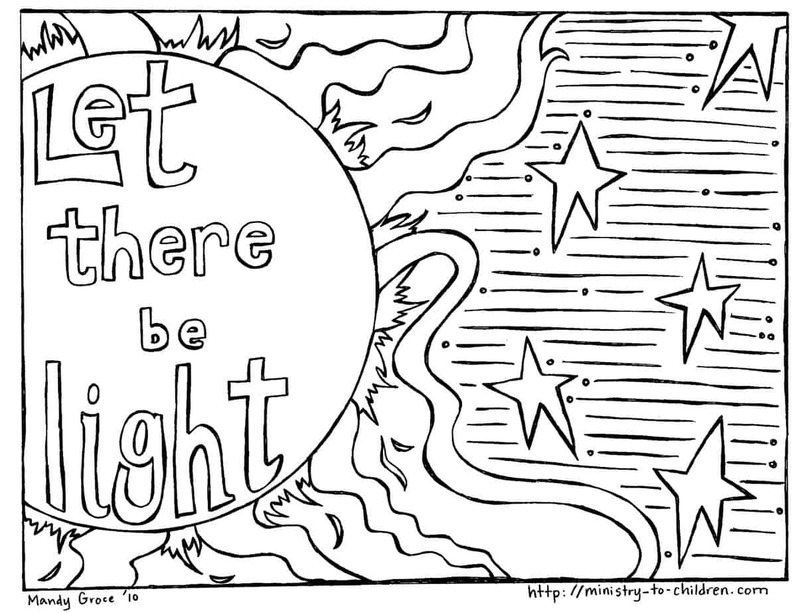 This coloring sheet could be a great add-on to any lesson plan about the fourth day of creation. It would also fit when teaching about the power and eternal nature of God. His work in creation gives us another reason to worship God. 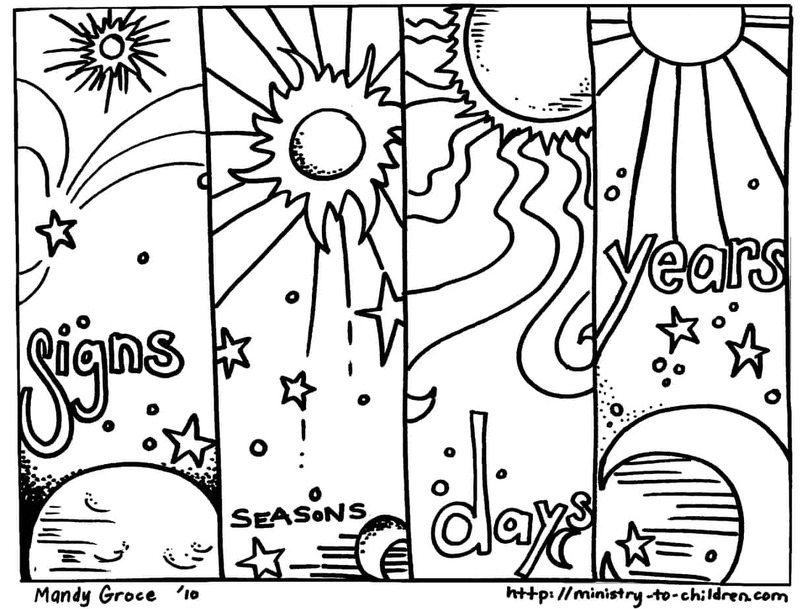 Here is the link to print all our days of creation coloring sheets. This page shows another view of the sun and stars, except with the quote when God said, “Let their be light.” Technically this verses is from day one of creation, but the sun is our continuing testimony of God’s invention of light. This can be used to talk about God as the true source of light because he is the maker of these physical objects. Directions: Click on the image to the right to download this resource as a printer friendly PDF file. Alternately, you can download the image as a jpeg image file (499K) if you want to resize or paste it into a Word Document. I am using the resources and the coloring pages as I have a vast span of age differences in my Children’s Worship. I need something to appeal to the older children so they can continue to learn but I need something basic to keep the attention of the younger children. I use the material in conjunction with other resources to have the older children help the younger children do all will be able to learn, share, help others and experience the wonderful nature of God while learning about the Bible. Thank you for these free resources as I moved into a new state where the church is very small without a lot of attention to children at this time. God bless you and your ministry. Thanks Mandy for sharing your talent! and thank you for color page;i use them in my class ;children are very interesting to paint after bible lesson.